This stealth knife features a blade made from Grivory, the latest in fiberglass reinforced plastic, which is stronger than even the super tough Zytel material. The blade has been UV and heat stabilized, making it impervious to the elements. The handle material is deeply checkered Kraton that has been molded directly to the blade tang. This knife is light enough to be tied, tucked, or taped just about anywhere on one"s person, and may be hide both inside and outside your house. Lightweight, realistic size, and a very stiff plastic. 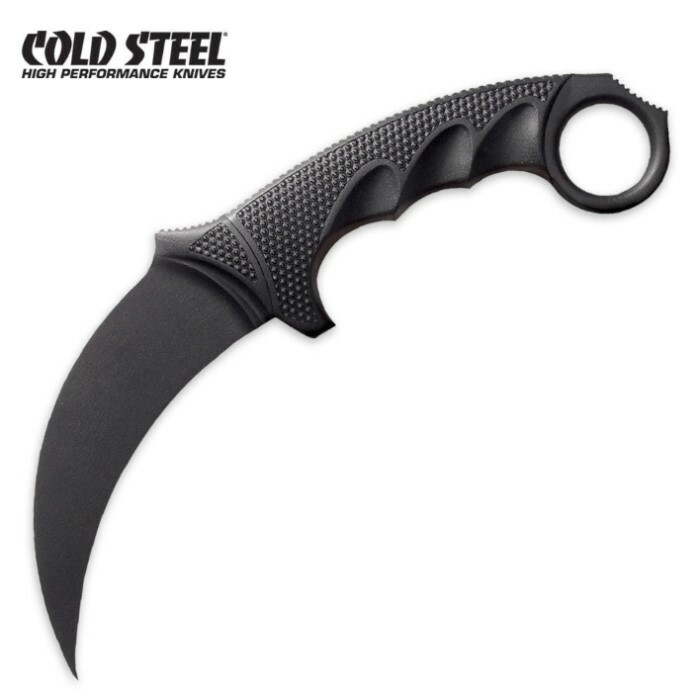 I bought this as a trainer for my real karambit and I couldn't be happier, I have the honshu karambit and it's roughly the same size and curve. The blade on this is basically a dull knife with a reasonably sharp point (for plastic). It COULD hurt someone, but I'm pretty sure it would take 4-5x the effort of a real karambit. That said, practicing movements after blunting the tip is easy and relatively safe. This knife is cheap and durable as long as you aren't trying to use it as a REAL knife. Pros. Light weight , great design and size cons. Came with a dulled tip and the whole thing is dull enough to not cut without extreme force and probably cant be sharpened. My opinion. This is amazing. It's super light. A durable as hell plastic and surprisingly sharp too. Feels great. However being plastic, it can damage it's easily quite easily. So be careful if you want this to last. This purchase was not what I expected. It has no sheath so no way to legally carry it. Tip is blunt and I see no way to use as self defense tool. At the first mention of any concern we have contacted our customer to ensure their order experience is a positive one and that any matters are well resolved. As always, should there be any problem or concern with a product or otherwise, please contact us and we will resolve it quickly. This item is made from fiberglass reinforced plastic and Kraton materials as detailed on the product listing and category heading. Their value and design is that of a self defense knife which can virtually be hidden anywhere. Impervious to heat, cold, moisture and extreme weather, and priced low enough to be kept in every room of your home, outside in the garden, and even in the shower. As designed by their manufacturer, Cold Steel, these knives are light enough to be tied, tucked, or taped just about anywhere on one's person. These light weight and stealthy fighters are designed to be on hand when needed. They are not designed or marketed as a replacement for your metal bladed knives, but instead they fill a self defense niche where metal bladed knives may not be suitable or practical.